It’s ink time at the Monoprice website, coupon code INK15 gets you 15% OFF Ink and Toner purchases, and orders of $50+ get FREE Standard US Shipping (something that is not to be taken for granted at Monoprice). The ink coupon runs until April 9 in 2017. Meanwhile the Friday coupons are back, END20 is $20 off a $100+ order, and MONTH5 is $5 off a $25+ order. The usual exclusions and limitations apply to these coupons. You can test them in the shopping cart without logging in or signing up. You can also get a S&H estimate by entering a zipcode in the cart (without logging in or signing up). The dream of the 90s is alive! Not in Portland, but at the eBay Deals where the BuyDig eBay store offers “His” and “Hers printers. Okay, you have to make your own “His” and “Hers” stickers, but they are offering a 2-Pack of Canon PIXMA MG 6820 wireless all-in-one inkjet printers for $95 with free shipping. You get TWO printers for the price. Limit five bundles per customer. PS: if you are eligible, don’t forget to also use $10 off $25+ coupon. The eBay page will remind you (subtly) if you are logged on to an eBay account that is eligible for the promotion. Costco action now, a coupon book preview is up, covering the March 23 to April 17 (2017) time period. Towards the bottom of the coupon book there is a $2 off inkjet cartridge refills promotion. This is limit two. But if you have any other Costco member friends, they may be willing to use / hand you their coupons too, since ink refills are not considered a doorbuster type of an offer for the uninitiated. 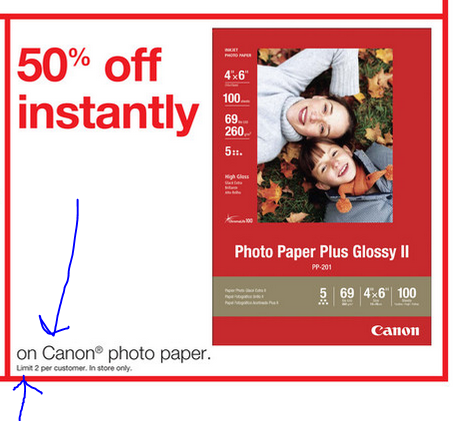 The official Canon USA store has a paper doorbuster deal, buy one 50-pack of 4×6 photo paper (model GP-701, glossy), get NINE (9) of them FREE. The price for one is $10 with free shipping. So you get ten 50-packs for $10 with free shipping. This is a limited time offer (these often sell out before they expire). The Canon PIXMA MX492 Wireless All-In-One Printer is currently on sale for $45 with free shipping or free store pickup by Best Buy on eBay (limit 10 per customer) and at Amazon by Amazon itself (limit 4; Prime only). WDBUZG0010BBK-EESN) for $45 with free shipping or free store pickup. Limit up to three per customer. If you want the Canon Pixma PRO 100 printer but don’t need a DSLR bundle, B&H Photo is running a WPPI 2017 promotion on the printer on its own, bundled with its trusty sidekick (50pk SG-201 13×19″ photo paper). You must enter coupon code BHWPPI17 at checkout for this offer. You pay $380 at checkout, receive the order, make sure all is well, submit the mail-in rebate following instructions and deadlines, and if all is well, after a few weeks, you receive a $300 prepaid American Express gift card, making it an $80 after $300 MIR promotion. Offer ends 2/12/17. For more action, check the on-going WPPI 2017 Specials at B&H. Printing time, the Canon MG5720 Wireless All-In-One Printer is on sale for $40 at Amazon by Amazon itself (limit up to four per customer). This is not a lightning deal. Currently only Prime members can purchase this. The HP Envy 5540 Wireless All-in-One Photo Printer is currently on sale for $65 with free shipping at Amazon by Amazon itself with a limit of two units per customer. This is a sale, like the Canon 50mm f1.2L going for $1149, not a lightning deal. This sale too ended… The HP Envy 4520 Wireless All in One Photo Printer (with mobile printing, and “instant ink ready”) is on sale for $50 with free shipping with a limit of two units per customer at Amazon by Amazon itself where it is currently the #1 best selling inkjet printer. This is not a lightning deal. If you are collecting printers, or need a low budget model (assuming you can also get good prices on the inks) or if you simply need a printer to take advantage of trade-in promotions, there are a couple of sub-$20 shipped offers for the white Canon MG-2520 printer at the eBay Deals. Both of the models mentioned below come WITHOUT an ink cartridge. You can’t print with them unless you buy/use your own inks. NewEgg’s eBay store is offering them in seller-refurbished condition for $13 with free shipping, with a limit of five per customer. I am not sure how they do this, since the printers are not exactly lightweight like a greeting card 🙂 There is no mention of warranty in the NewEgg listing. The listing by eBay seller “Always.Deals” (98.4%, New Jersey) on the other hand, lists this as an “Open Box” with a 1-year warranty from the seller (not Canon USA), going for $17~ with free shipping with a limit of up to 50 per customer. This is non-returnable. TL;DR for the high-speed readers. The above offers DO NOT INCLUDE INK! You can’t print with these unless you buy or use your own inks. There are no inks in the box. Zink paper action now, 20 sheets of Polaroid 2×3 inch Premium ZINK Photo Paper (delivered as two 10-packs) are on sale for $8.49 at Amazon by Amazon itself. Limit up to 30 sets per customer. Free shipping for Prime members or with a $49+ order. This is not a Lightning Deal. Trending at the Trending eBay Deals, Adorama’s eBay store has a printer doorbuster of sorts, the new condition Canon PIXMA MG3620 Wireless Inkjet Photo All-in-One Printer is offered for $29 with free shipping, with up to fifty per buyer. The LG PD239W Pocket Photo Printer is bundled with a 30pk of LG Photo paper, together for $130 with free shipping at Adorama, another one of their 5000+ specials. And now a printer doorbuster of sorts, the Canon PIXMA MG3620 Wireless All-in-One Inkjet Printer is on sale for $28 with free shipping, for a limited time, at B&H Photo as one of their many Featured Sales. Another printer is making the rounds at the eBay deals, it is the new condition Canon Pixma MG3620 Wireless Inkjet All-In-One offered for $26 with free shipping with a limit of five units per customer by BuyDig on eBay. As of 11/1/16 re-check, the price returned to $15… The pack with 30 sheets of Polaroid 2×3 inch Premium ZINK Photo Paper is on sale for $10 at Amazon by Amazon itself with a limit of 90 per customer. This is currently the same price as the 20-pack, so you are getting 50% more for the same price. This is not a lightning deal. Among the latest Trending eBay Deals, the official Buydig eBay store is offering the new condition Canon PIXMA MX922 printer for $83 with free shipping. Limit 50 per customer, but don’t try to fit all fifty under the tree 😉 Buydig is Beach Camera and they are authorized Canon dealers. Over 2800 of these got sold from that particular listing per the data posted over there. Never a dull moment in the eBay Deals, printer and rebate action now, the BeachCamera not BuyDig; but they are the same actual company) eBay store is offering the new condition Canon Pixma PRO 100 Printer and 50pk of 13×19″ Paper for $300 with free shipping. This is eligible for the $250 Canon mail-in rebate (prepaid American Express gift card) as BuyDig/BeachCamera is/are authorized Canon dealers, making it a $50 after MIR (GC) offer. Over 400 printers got sold from this offer so far. Best Buy is celebrating its 50 year anniversary with a sale-a-bration featuring (..wait for it…) 50 items, including the DJI Phantom 4 Quadcopter with an extra battery for $1200, and the Polaroid ZIP Mobile Printer for $80. Many of the Best Buy camera offers include an optional Shutterfly promo. Free shipping or store pickup. It looks like the Polaroid printer is price-matched at Amazon in either black or white with a limit of ten units per color per customer. You don’t need a printer to print this coupon but it can get you a printer at a discount 😉 For a limited time, Adorama is offering the Canon PIXMA MG2520 Inkjet Photo All-in-One Printer for $19 with free shipping when you enter coupon code CAPRINTD over there. The price before couponization is $39. Ink is included. Offer ends by 7/31/16 or earlier if sold out. Printing time! The 25pk Epson 8.5×11 inch Epson Ultra Premium Photo Paper Glossy, model S042182, is currently on sale for $11 with a limit of two per customer at Amazon by Amazon itself. The usual free shipping terms apply (Prime or with a $49+ order). If you just want the Canon Pixma PRO 100 printer and don’t want to get it with the various Canon DSLR bundles, the printer itself, along with its trusty sidekick (50pk 13×19″ photo paper) can be yours for $50 after coupon code PSWBH16 and after a $250 mail-in rebate (prepaid gift card) at B&H Photo. Offer ends 7/24/16. If you want the Canon Pixma PRO-10 printer but are not interested in any of the DSLR bundles, you can get the Canon PIXMA PRO-10 Printer at B&H Photo for $250 with free shipping after a $250 mail-in rebate and after you enter coupon code BHOPTIC16 over there. You also get its usual free sidekick included in the box by B&H (50pk SG-201 13×19″ photo paper). Coupon offer ends 6/8/16 (the mail-in rebate continues as per its own terms). According to the sneak peek weekly ad posted on the Staples website, for the shopping week of June 5-11 in 2016 (Sunday AM until Saturday PM), they will have a 50% off sale on HP, Epson and Canon photo papers. The sale price is off the list price most likely, so YMMV as to how good it might be compared to the rest of the market. Particularly of interest if you have Staples Rewards or Store Credit or Gift Cards you want to spend. I don’t know if the sale will be online as well as the Weekly Ad covers their stores mostly. On the printing side of things, the Epson WorkForce WF-3640 Wireless Color All-in-One (AiO) Inkjet Printer is on sale until 5/7/16 at 11:59pm ET for $100 with free standard shipping from B&H Photo. The Epson Expression Home XP-420 is currently on sale for $50 with free shipping at Amazon by Amazon herself with a limit of two per customer. On the same page, you will also find two printer+ink bundles in case you need to get ink as well. Price-check the ink bundles depending on how much you need. This averages 3.9 out of 5 based on over 1000 customer reviews. … B&H Photo is offering the Canon Pixma PRO 100 printer for $100 after a $250 mail-in rebate (prepaid American Express gift card) when you enter coupon code BHWPPI16 at Checkout. The price without the coupon is $150 after MIR. B&H will also include automatically this printer’s “Robin”, a 50pk of 13×19″ Canon photo paper. Coupon offer ends 3/10/16. The Fujifilm Instax Share Smartphone Printer SP-1 is currently on sale for just under $135 at Amazon by Amazon itself with a limit of two per customer. The shipping estimate is “February 4” as of the time of writing. It is in-stock from other lesser-known 3rd-party sellers over there, but I do not know if they are authorized dealers. I also don’t know the authorized dealer status of the following seller, but it is one of the featured eBay Deals, it is the above printer bundled two 10pks of Instax Instant Film for $149 with free shipping by eBay seller “PhotoVideo4Less” (99.9%), with a limit of five kits per customer. Last week the Epson Expression Home XP-420 AiO Inkjet Printer was on sale for $60, but now it has dropped to $50 with free shipping at B&H Photo and at Amazon (limit 2) where it averages 3.8 out of 5 based on nearly 800 customer reviews. Adorama has a manual bundle offer that gets you two items for $22 with free shipping. You start at the product page for the Canon 3×3″ Pocket Size Inkjet Photo Album with Software. From there, expand the section with the yellow “Special Offer”. The only option you see there is the Canon Pixma MG2922 printer. Click on the blue “Add to Bundle” button, then click on the bigger green “Add Bundle to Cart” button below and proceed to checkout. Your shopping cart will have those two for $22 with free shipping. Offer ends 1/24/16 or earlier if sold out. The Epson Expression Home XP-420 All-in-One Inkjet Printer (no faxing) is on sale for $60 with free expedited shipping at B&H Photo. If you need more, it’s also going for the same price at Amazon (limit 2).